Taking the CBASE? We can help! Preparing for the College Basic Academic Subjects Examination (CBASE) ? CBASE, or the College Academic Subjects Examination is a requirement for bachelor degree graduates. Students become eligible to take the CBASE test after completing a minimum of 96 hours. 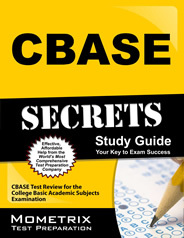 Students are advised to take the CBASE test during their graduating semester. Social Studies: the social sciences and history. Ability to reason as well to analyze information to reach a logical hypotheses or conclusion is also assessed. The CBASE test sessions last for about three and half to four hours. See our post, Working with Time Limits on Standardized tests. This time includes time for the test and orientation. No one is allowed to leave early. Students who leave early have to re-take the test. Students should bring a copy of the verification form from their online registration for the exam. They will also need photo id, which can be a student id or a government issued id. You will also need 2 pencils and a standard conventional calculator. No cell phones, alarm devices or pagers are allowed. Those who fail to meet the minimum requirement on any one or more sections may retake and pass that section within 2 years from admission. If the student fails to pass the failed part within 2 years they have to retake the entire exam. Study guide prepared by a dedicated team of expert researchers. Includes practice tests, study plan, sample questions, test tips and complete review. Includes practice questions. Order Now - PDF Download or Printed book. Modified: [insert_php] the_modified_date('F jS, Y'); [/insert_php] [insert_php] the_modified_date('F jS, Y'); [/insert_php] Published: [insert_php] the_time('F jS, Y'); [/insert_php] Written by: Brian Stocker MA, Complete Test Preparation Inc.